We will describe here how you can implement Getting Things Done® (GTD®) system using MyLifeOrganized (MLO) application. If you are not familiar with the GTD® methodology, you'd probably best start with introductions on the official GTD site, Wikipedia or similar sources. David Allen’s GTD® involves clearing your mind of all the things you keep remembering and thinking about, that are nagging at you to do them. The idea is that if you can get these things written down into a system you trust, and know that you’ll be reminded of them at the appropriate time, you can free up your mind and use all that spare head-space for something more useful. MyLifeOrganized does not tell you how to organize your system. But MLO gives you all the necessary tools so that you can get everything out of your head and create your own structure of a logical and trusted system which will work for you the best way. Place everything that comes to mind right into the planning area of MLO - unlimited and hierarchical Outline. It includes a special place for all unsorted data - Inbox. So, even better to capture in there. With a system shortcut you can open the Rapid Task Entry dialog and quickly enter a task using using everyday language like "Send out invitations tomorrow 3pm remind 10 min in advance" . The feature includes natural language parsing for quick input of tasks. Process tasks after your initial brain dump. Decide whether they are actionable and require additional actions - such items are likely to become Projects. Add all the additional classifying data for each actionable task (Due Date, Context, Reminders etc.) and set your Goals. Tip: Sync MLO with your Google Calendar and the tasks with dates will be reflected on both sides. Follow our setup guide. Organize tasks into specific projects using drag&drop. Break up complex tasks into feasible subtasks. With unlimited hierarchy MLO let you keep everything structured. Keep your goals on track — review them regularly. 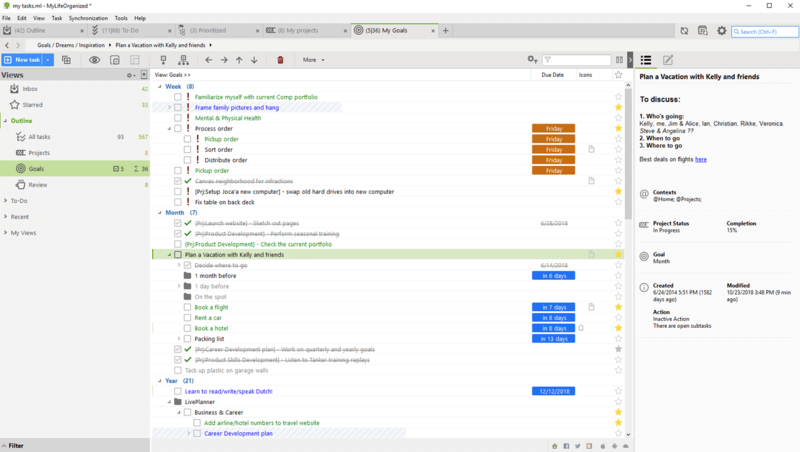 You can review a project weekly to add new tasks to it or to change priorities of the subtasks. When it is time for the next review this project is placed to the default Review view where you can adjust it if necessary. 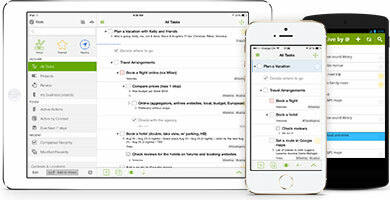 Views available in MLO let you always keep organised lists of tasks at hand. MLO pulls up a list of specialized tasks based on your input: To-Do list with only Active Actions, Projects, tasks grouped by Contexts and many other views are available in the app. So, there is no question how to pick which task to do now. Just open the required view like "Active by Context", so you can probably only do things of one or two contexts right now anyway – so the rest can be ignored. After that, it comes down to how much time you have, how much energy you have, and how important the things are - open the corresponding view in MLO to check your further actions. Tip: MLO comes with several templates which show how GTD® trusted systems could be implemented with the application. To pick a template open menu File->New... and select a template. Next Actions are a concept from Getting Things Done®. 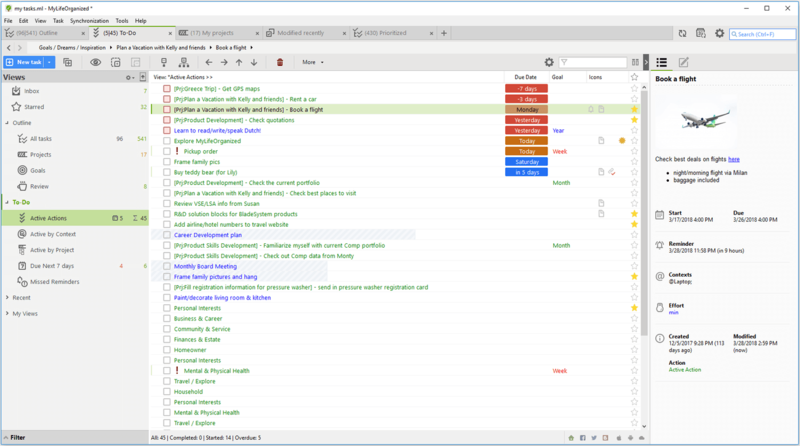 If you use "complete sub-tasks in order" option for the project tasks, then your To-Do views will show you only the most up-to-date Next Action for each project in the overall list (as recommended in GTD®). Each your action will be put in a right context. You can filter your actions by time and energy available. Each time you complete a task the To-Do list is regenerated to keep it updated and right ordered basing on a sophisticated Prioritization Algorithm. MLO does not let you to forget why you are doing this task by adding Project name to it. In MyLifeOrganized you can set an option "This is a project" for a task. In doing so, you will include this task into "Projects View. In this view projects are grouped by statuses and are easy to review. There is also dynamically calculated completion percentage for a project. This percentage is based on how many subtasks of the project are completed and what their Effort properties are. You can indicate that a certain task is a weekly goal, monthly goal or yearly goal. The special "Goals" view is designed to easily review all your goals. Do you need access to your to-do's and personal projects information while on the road? It is no problem with MyLifeOrganized! There are mobile editions of of MyLifeOrganized application which can be synced with MLO for Windows. The following MLO mobile applications available right now: MLO-iPad, MLO-iPhone, MLO-Android. Do not miss opportunity to work on a task when it is right time and place for this! Refer to our User Manual to learn more about the features mentioned above.